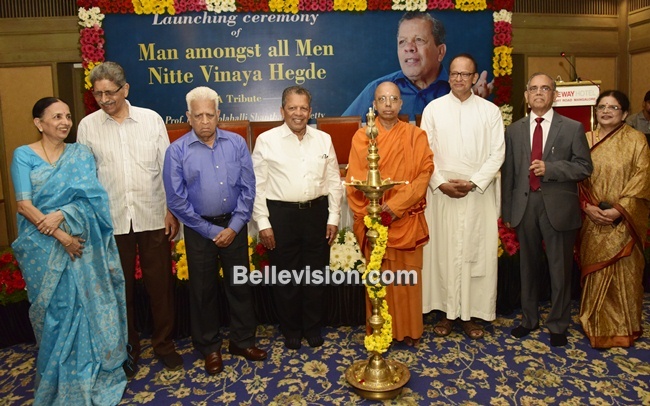 Mangaluru, 15 Apr: Man amongst All Men, biography on the life of eighty-year-old Nitte Vinaya Hegde, chancellor of Nitte Deemed to be University that was authored by Prof Dr M Shantharam Shetty, pro-chancellor of Nitte Deemed to be University and chairman of Tejasvini Hospital& SSIOT, was released during a function held at Cabinet Hall of Hotel Gateway, here on Sunday, April 14 afternoon. 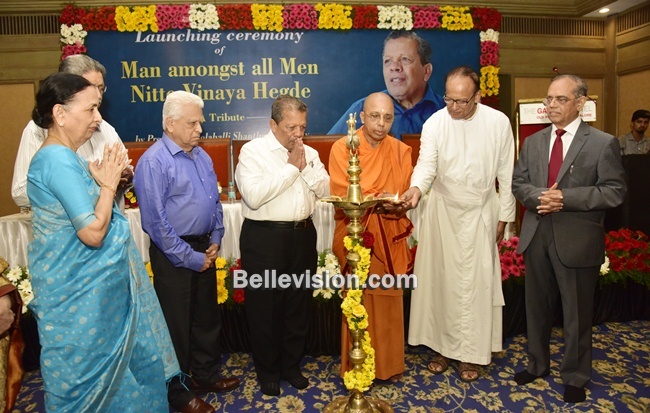 Swami Jeethakamananda, president of Ramakrishna mutt, Mangaluru; Fr Denzel Lobo SJ, director of Aloysius Institute of Management and Information Technology (AIMIT), Mangaluru; Prof N R Shetty, chancellor of Central University of Karnataka; Dr Dineshchandra Hegde were the dignitaries inaugurated the programme and later released the book, Man amongst All Men, biography on the life of successful entrepreneur, educationist and philanthropist – Vinaya Hegde. 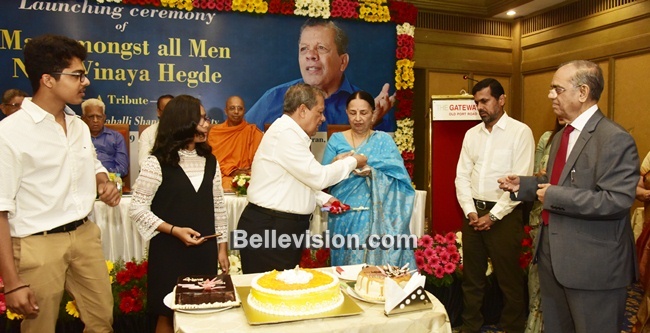 Speaking on the occasion, Swami Jeethakamananda said that the book is youth-oriented, as it has advices on hard work, commitment, social concern and harness sharp thinking to become exceptionally successful in life. He lauded the human virtue of Vinay Hegde whose philanthropic activities helped many poor students to excel in studies. 1) Identifying Problem and find cost effective solution. 2) Passion – to capitalize on passion to carve out better future. 3) People (team) – businesses are built with team spirit. 4) Pivot – get all info ready for necessary action. 5) Perseverance – when things take long time to take shape have patience till the last. 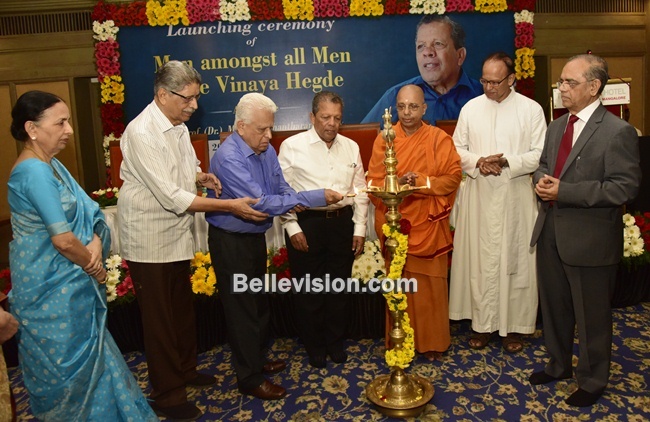 He also lauded the entrepreneurial qualities of Vinaya Hegde in setting up Lamina Suspensions Private Limited in 1975 after amassing work experience with Canara Workshop in Mangaluru that was leading enterprise owned by Kudwa family and later founding K S Hegde Medical Academy, Nitte Enginering College and others. Vinay Hegde said he is more contented in life because he believes in team work that has taken him to achieve the impossible. He fondly recalls his motherly love in shaping his future. 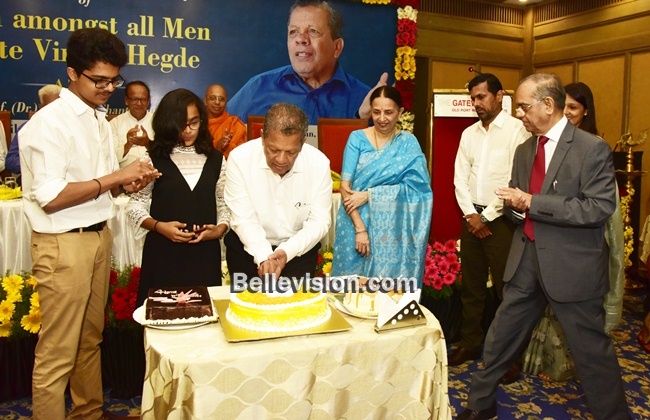 Eightieth birthday of Vinay Hegde (actually born on April 3) and seventy-seventh birthday of Dr Shantharam Shetty (April 14) was celebrated by cutting the cakes during the programme. 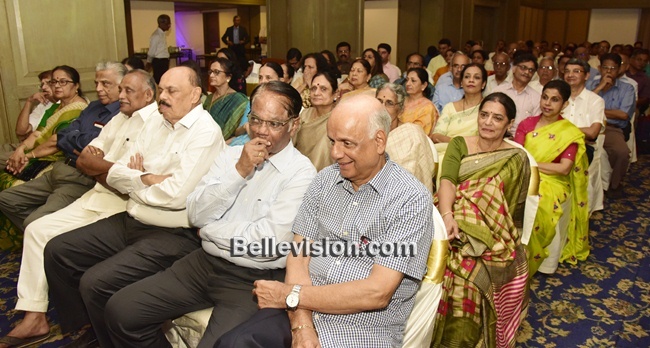 Manipal University pro-chancellor Dr H S Ballal couple felicitated Vinay Hegde on the same occasion. 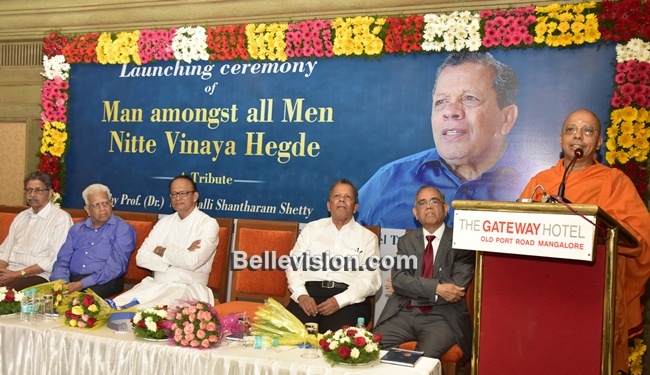 Vishal Hegde, son of Vinay Hegde thanked the gathering in attending the event. Mementoe was presented to the designer of book – Prasanna. Vinothini rendered the prayer song. Dr Shantharam welcomed the gathering and delivered the preliminary address. Dr Ajit Kumar proposed the vote of thanks. Regina Ganesh compered the programme. 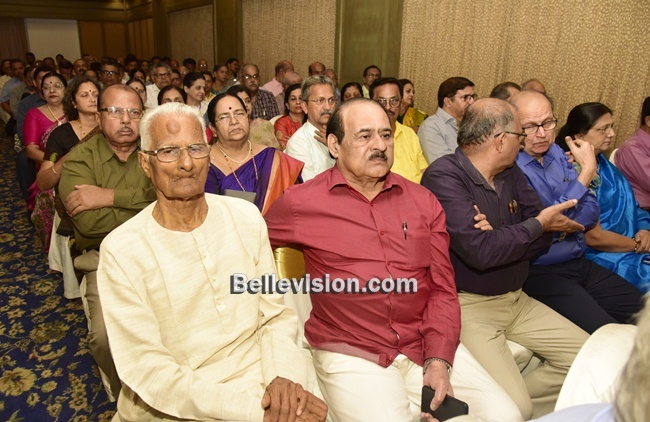 A large numbers of well wishers of Vinay Hegde and Dr Shantharam Shetty were present.